Christmas is a wonderful time to gather with family and friends because this is the season to be jolly! Needless to say, restaurants and hotels are pulling out all stops when it comes to their festive buffets to create a memorable Christmas for everyone. 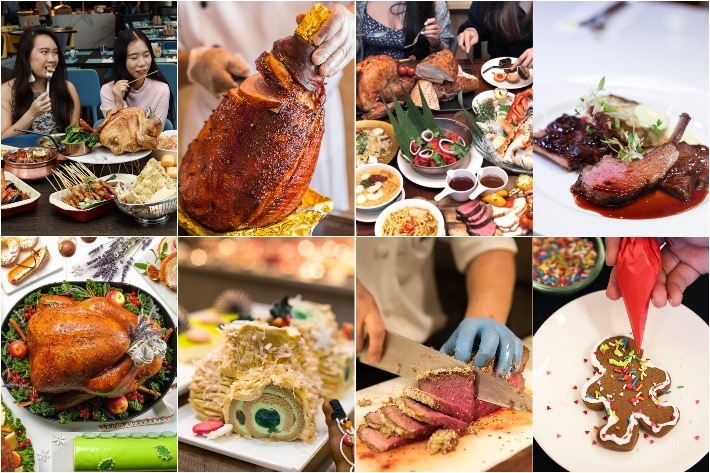 Royale—an all-day dining restaurant located at Mercure Singapore Bugis—has made it into our list as one of the best options for Christmas this year. The team behind the restaurant has prepared a sensational holiday buffet and you would be surprised by its affordable price tag. For the entire month of December, delight yourself in ‘A Globetrotting Christmas’ buffet feast from S$48++ per adult/ S$24++ per child. The buffet features over 40 holiday recipes intertwined with Asian flavours such as Oven Baked Nonya Turkey served with Homemade Chili Sauce and Baked Honey Cinnamon Gammon Ham with Citrus Sauce. In Sunny Singapore, you might not get snow or reindeers (not real ones anyway), but Christmas in Singapore is as big as any other celebration during the year and it is one that foodies like us look forward to the most. With the multitude of Christmas spreads and Yuletide menus popping up at restaurants or even at house gatherings across the island, there is no doubt that turkey and honey-baked ham will be among the top of many people’s list. But let’s face it, a feast would still be a feast even without the fancy centerpieces and pimped-up wines. At its heart, Christmas is still a time for reunion and indulgence, and in multi-cultural Singapore, there are many local delights that you can include in your dinner spread for that Asian-style Christmas dinner. In this day and age, we are accustomed to believing that Christmas dinners have to be over the top, or at the very least, presentable for the guests. However, those who understand the true meaning of this festive season would know that it is simply just a dinner that brings your loved ones together. Yes, Christmas dinners do not have to be extravagant. Living in Singapore is not exactly a cheap affair and most of us have other financial responsibilities to bear. Going for a fancy dinner on a festive occasion may be out of the budget for some of us but that does not mean we cannot have a delightful Christmas party at home!